Note: This product is EU frequency band standard, only suitable for European and Asian countries. 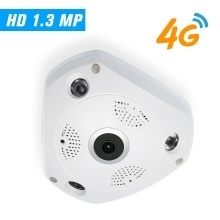 *HD 1080P 3G/4G IP Camera, 1/2.7" CMOS sensor, 2.0 Megapixels, 1080P high definition video recording. *1.44mm fisheye lens, 360° panoramic wide view angle, no blind area letting the whole room under your eyes to keep more of what you care safe for your shop/office/home/baby/pet monitor, etc. *3G/4G mobile remote control when no network. Insert a SIM card in the security camera, and download APP on Android/IOS, then you can monitor anytime anywhere even in abroad. *Built-in RJ-45 interface support P2P, plug & play, view on PC & Smart phone, support Firefox, Safari, Chrome browser. *With IR-CUT double filter, auto switch between day/night, restoring clear image and true color both day and night, 3pcs array IR leds, night visibility up to 40m. *Motion detection recording. The camera will be triggered to record when detect something moving. *Notification alert function. When motion detection is triggered, the camera will send alarm notifications to your phone, including snapshots on the spot. *Support snapshot uploaded to FTP, snapshot and video to TF Card.